Are there Satanists in our Pulpits? Backsliders: God doesn't hate you! This web site exists to evangelize them while edifying True Disciples of Christ. 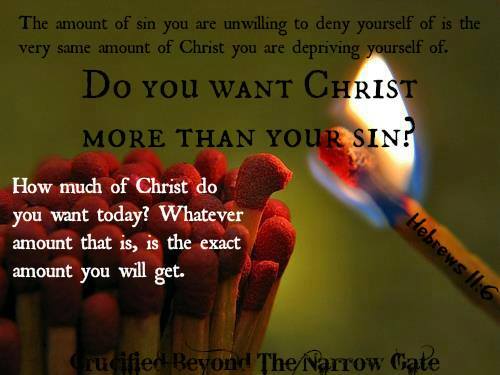 Deny not Christ by your sin...Don't deprive yourself of the only thing you can keep by holding onto things you cannot. Seek Him fully with a graphic devotion......embrace your cross and lose your life that you may gain it. Seek Him with a stubborn, resolute and reckless passion. Let your recklessness be found in Christ...not in your sin. Throw caution to the wind and die...that you might live. Seek Him now...not tomorrow. Seek Him always...not just sometimes. Seek Him diligently and allow Him to reward you with the fulness of His presence. The reward for diligent seekers is the Lord Himself. How much of Him do you want?